You're in for a long one here folks. Obama bought this HALF HOUR spot and aired it on seven TV channels during prime time. Epic. Don't forget to GO VOTE! There's been a few commercials relating to b-ball lately that I've found semi-enjoyable. And lucky for you, I've decided to lay 'em all out for your viewing pleasure. Pick and roll. This first one is for NBA TV. It's footage of Kevin Garnett talking about himself and his team throughout the season. I like how they splice the clips together. At times it progresses almost seamlessly. It was probably a pretty cheap spot, too. The music dawdling in the background is "Slonce Moje" by Human. Next up is an ad for American Airlines. Don't you love happy endings? Kevin Garnett returns to endorse the video game NBA 2K9. The commercials epitomize the attitudes and habits of gamers just chilling with their bros. Remember these gems? Some quick strokes and the Postal Service. I just saw one on TV today and it reminded me how enchanting this campaign can be. I don't know why, but I love watching this guy draw his little sketches on that dry erase board. Do you think he practices that a lot? The man with the marker is named Andy Azula, and he's the creative director of the campaign. Usually people in that position stay behind the camera, but the agency felt it was appropriate for him to appear in the actual commercials after they found several focus groups preferring him over the other professional actors cast for the role. The ads are directed by Errol Morris. Seems to be a lot of worthy video game commercials lately. Maybe I'm just their target market and they know what I like! The name of the song in this commercial is "How It Ends" by Devotchka. The discordant sounds give an edgy feel to the video, and if you've ever played the game, you know that the song fits in perfectly. I distinctly remember the commercial from the last Gears of War game. It was a very dark and dreary spot with the song "Mad World" by Gary Jules. Once again they have chosen a tune that will capture the interest of the audience and generate attention. I think it has something to do with the executive producer, Jeff Baron. He's been involved in the Nike Fate commercial as well as several other spots with awesome audio. Ahh... the sweet, sweet sound of curb stomps and chain saws awaits me. This Risky Business styled ad features Michael Phelps, Kobe Bryant, Alex Rodriguez, and Tony Hawk rocking out to "Old Time Rock and Roll" performed by Bob Seger. It's for the new Guitar Hero game. I'm sure this assemblage of super stardom will attract many of potential heroes. Remember that classic Budweiser "Wassup" commercial? Here's a spoof of it. Wasssuuuuup. All this for just 30p! Brilliant! I had to post this ad from the UK. I thought it was pretty cool, a very unique idea. The name of the song in this commercial is called "I Just Can't Get Enough" by Wallis Bird. It's a cover of Depeche Mode. This spot is a few months old, but I've just stumbled upon it. Cox Communications hopes these little guys can emphasize their message: "Your Friend in the Digital Age." The little pod people are called Digis. The song in this spot: Justin Sconza (from band Walter Meego), “Pretty Picture,” published through Spectre. Click here for more. For more information from the studio responsible for the comercials, click here. 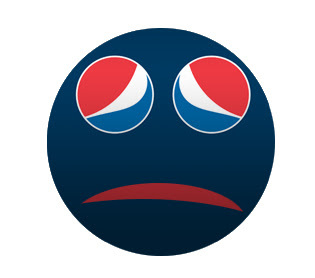 The new logo is just a small part of PepsiCo's $1.2 Billion attempt to try and get back some drinkers who have drifted to the Coke side of life. 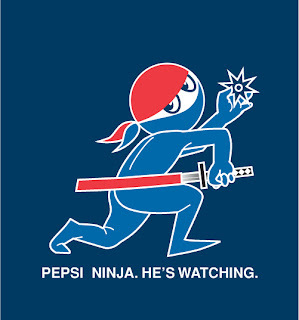 Over the course of three years, Pepsi hopes to increase their market share with new packaging, merchandising, and advertising. So why the new logo? Is Pepsi trying to tell us something about who they want for president, or which airline they prefer? No, apparently the white band is supposed to be a smile. 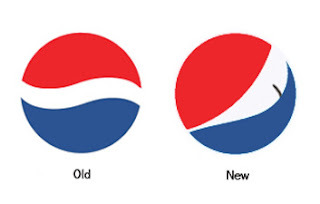 Other brands will also be getting remodeled as happy mouth shapes: Diet Pepsi will be a grin and Pepsi Max will be a laugh. Also, Mountain Dew will become Mtn Dew. Srsly. They claim that Coke is not the culprit, but the bad economy. People have stopped buying carbonated soft drinks, and they hope the change can bring back drinkers. Unfortunately, the move also comes with a 3,000 person job cut, and six plants will be shut down. Note: All of these images have been stolen from the internet, and are in no way mine. I can hear Bill Gates' shrieks of pain from here. It seems that this little battle between the two computer giants always ends in the same way; with the victor smirking beneath their white background and playful melodies. Now, I am a proud PC user. I enjoy the bickering between the brands, but I will not take sides. It's like two opposite viewpoints: neither is "right", neither is "better", it's what you prefer. These ads can also be related to the presidential campaigns. As the race gets more intense, parties resort to negative smear campaigns, and I bet it won't be long before Microsoft takes the low road as well. So far, they have focused on themselves and simply defended their case, but this ugly sport can no longer sustain civil communication... The fighting will escalate until ridiculous things happen: a Gates vs. Jobs wrestling match, an online civil war between the operating systems, mass virtual havoc! Until, of course, Google launches their line of computers/OS's and they take over the world. THE END. This mysterious, almost movie-like trailer is a great spot for Fable 2, a video game for the Xbox 360. It's very Lord of the Rings esque, and displays how you can transform and who you can become in the game. The agency responsible is named T.A.G. It's official. Wieden+Kennedy are the top of the top, by far my favorite agency. This commercial features Troy Polamalu and LaDainian Tomlinson as they grow up as active youngin's and eventually clash in the big league, as if fate would have it. The music to the commercial really puts the icing on the cake. It's "The Ecstasy of Gold" by Ennio Morricone. Old school retro style. The tag line is Leave Nothing. MTV's Hispanic channel tr3s celebrates Hispanic Heritage Month (September 15 - October 15) with these goofy spots. I find it kind of ironic that a commercial trying to honor Hispanics comes off as slightly racist... Oh well, they're freaking hilarious. Check out all eight, chico.